Irish Hills Farm has been well known for it's Quarter ponies. Our ponies are know for the great disposition, good conformation, and excellent movement. Our ponies have the personality to excell as all around ponies. Our ponies do well both in the show ring and on the trail. Our ponies have championships, futurity wins, money earners, and ribbon winners. ******We are no longer breeding Quarter Ponies. Our quarter ponies are for sale. IHF Silk Sensation, aka Fanny, is a 1992 grulla (black dun) quarter pony mare. She stands 13.3 hands tall. Fanny has won and competed successfully in hunt seat pleasure, English Pleasure, equitation, western pleasure, barrels, flags, and trail. She was English Pleasure 4-H Champion in 2008. Fanny is also used in our lesson program. IHF Silk Sensation has produced three fillies for us by Luck of the Irish --- Irish Golden Jewel (palomino), Irish Black Gold (grulla), and Irish Flicka (chestnut). 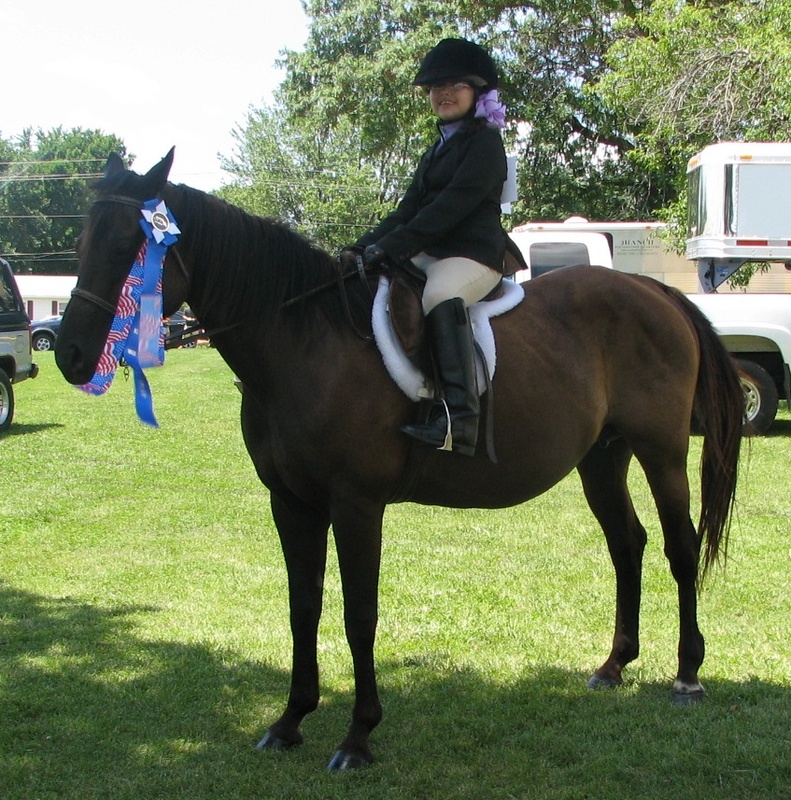 Irish Golden Jewel was the 2006 and 2007 QCABHA Futurity Overall Pony Champion. See pictures of IHF Silk Sensation and her daughters in the photo gallery. IHF Silk Sensation was hardshipped registered with IQPA. We did try to recover her original quarter/solid paint horse papers, but were met with several road blocks unfortunately. The only thing we know of her bloodlines is that she has some foundation breeding. 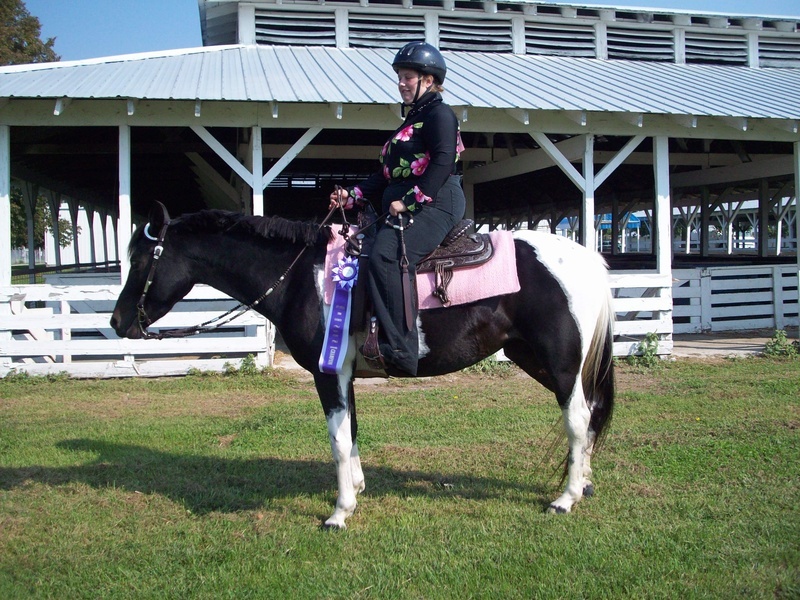 IHF Black Pearl, aka Pearl, is a 2003 black/white tobiano paint pony mare. She stands 13.3 1/2 hands tall. Pearl has been shown successfully in halter, walk/trot, English Pleasure, and western pleasure. She has competed in futurities and been in the money several times. Pearl championships include: 2004 QCABHA Futurity Reserve Champion Lounge Line, 2008 QCABHAB Futurity Champion Maturity Pleasure, and Knox County 4-H Overall Pony Champion. Pearl does show the potential of being competitive in reining or as a great all around horse. She was been shown both English and Western pleasure. You can see more pictures of Pearl in the photo gallery. We bred Pearl in 2010 for a 2011 foal to Luck of the Irish. She had a beautiful bay and white tobiano colt in 2011. His name is Unexpected Luck. Check him out in our photo gallery. We hope to eventually have her tested for being homozygous for black and/or tobiano gene. IHF Black Pearl is eligible for Pinto pony papers. We are planning to hardship register her with IQPA. Pearl's breeder was a elderly gentleman who raised lots of paints and quarter horses. He was not always the best at paperwork. Her sire's barn name was Bud. He was a black/whtie tobiano and was around 14.0/14.1 hands tall. This particular breeding farm preferred to breed working cattle lines and/or foundation bloodlines including Poco Bueno and Leo, which we suspect is in her pedigree somewhere.